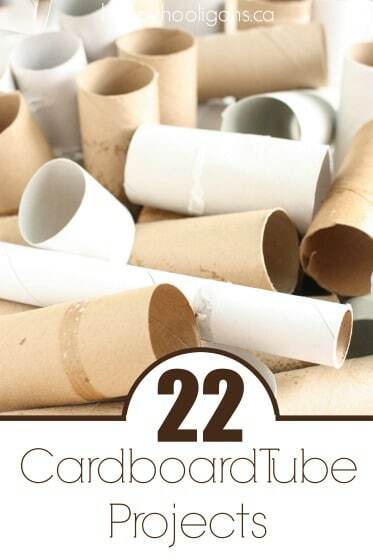 Home » Crafts for kids » Holiday Crafts » Christmas Crafts for Kids » 17+ Awesome Advent Calendars Your Kids Will LOVE! 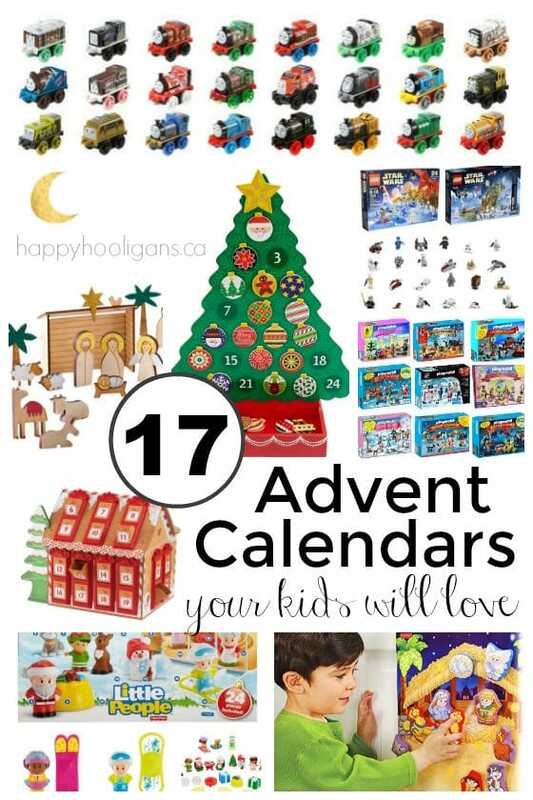 17+ Fun and awesome Advent Calendars for Kids. These aren’t any ordinary advent calendars! 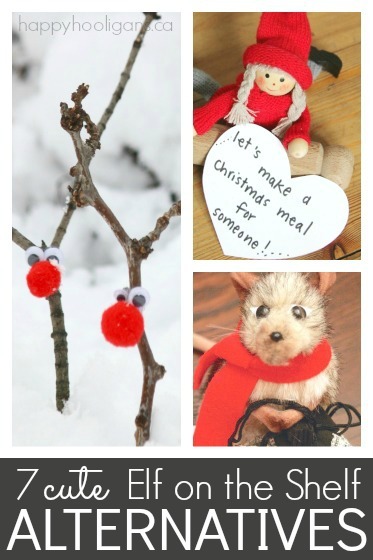 They’re fun and engaging and they’ll make the countdown to Christmas all the more special for children. Counting down the days to Christmas is an exciting tradition especially if there are young children in the family. The lead up to Christmas is such an exciting time for little ones and an advent calendar always makes the December countdown extra-special. When my boys were little, I always bought the ordinary advent calendars sold at the grocery store. They were made of lightweight cardboard, and had a festive Christmas scene on the front, and the boys would pop open a little, perforated door every day to find the small piece of chocolate hiding behind it. These calendars were very simple but my boys would get so excited as December drew closer, asking “how many days until we get our advents, Mom?” Then they would excitedly count down the days until they could have them. We almost needed an advent calendar for our advent calendars. Ha! Well, advent calendars have changed, let me tell you, and there are some pretty incredible ones out there today. All of these interactive and fun advent calendars make me wish I could go back in time, and do it all over again with my kids. I know my boys would have LOVED some of the advent calendars I’m sharing here today. I’ve rounded up a whole bunch of my favourite advent calendars to share with you. Some of these calendars are quite traditional, some are non-traditional, and some are based on the nativity. These calendars all have one thing in common though; they’ll make counting down the days to Christmas Day a whole lot of fun for your kids. And what’s great about most of these advent calendars is that they’ll live on long after Christmas has passed. 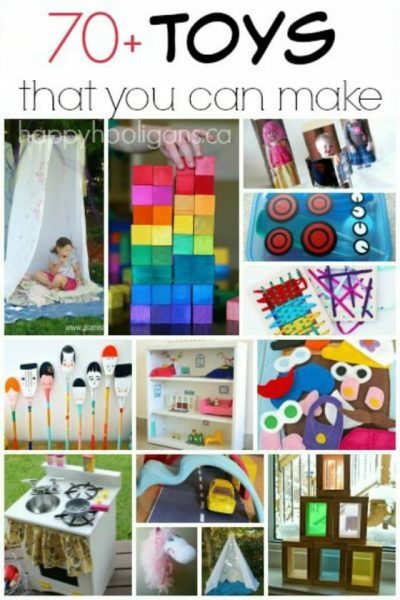 Many are filled with toys and goodies your children can enjoy year ’round. Some of these calendars can be re-used year after year, becoming an important part of the special memories your family creates together each Christmas season. I hope you like this collection as much as I do, and I hope you’ll find one that your child will love. For your convenience, I’ve provided my Amazon affiliate link for each of these products. 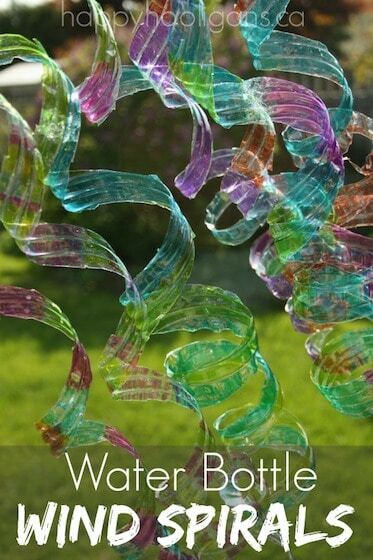 That way you can simply click through to purchase if you wish to. You can click on the image or on the link below it to view the calendar on Amazon. A word of advice though: whether you’re buying your advent calendar through the links here today or somewhere else online, be sure to do it early. They sell out quickly. Every year, I share these calendars on my Facebook page in weeks leading up to Christmas, and I often hear from disappointed followers that many are sold out by mid-November. 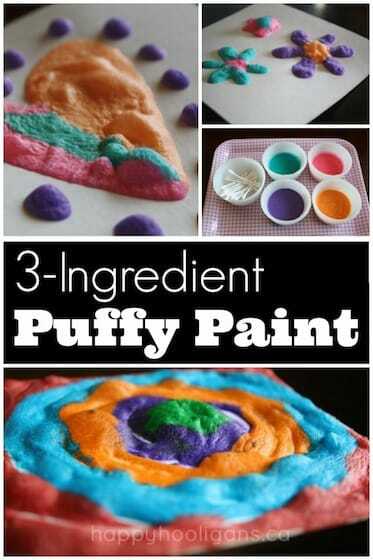 This one is great for toddlers! 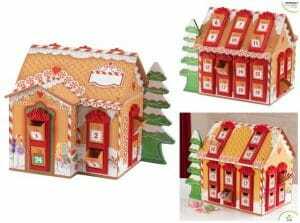 24 Little People toys and accessories hide behind the doors of this adorable Advent Calendar. Count down the days with Thomas and Friends! 24 Mini engines (including 6 special holiday engines) wait behind the doors of this advent calendar. LEGO fans and Star Wars fans alike will love this advent calendar! 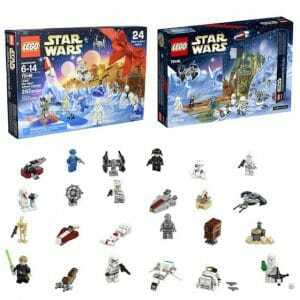 It contains 24 LEGO Star Wars characters, tools, and vehicles. Here’s another one for LEGOmanics! 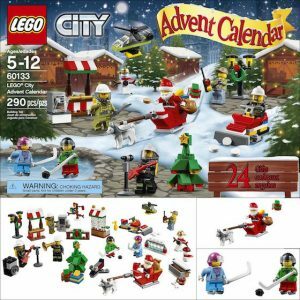 24 days of individual Lego mini figs and accessories coming your way! 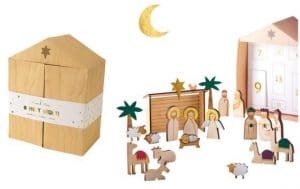 Little ones can build their own nativity scene, day by day, with these 24 adorable wooden figures. This wooden gingerbread house allows you to fill the compartments yourself with candies, coins, and small trinkets. 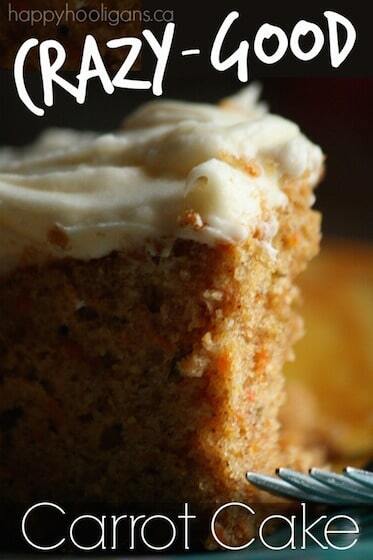 It can even be personalized with your child’s name. 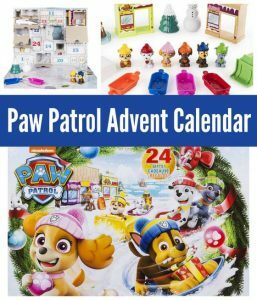 With the Paw Patrol Advent Calendar, kids will open a door every day to reveal a new Paw Patrol character or accessory. 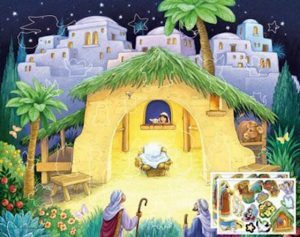 These nativity sticker calendars allow kids to create their own manger scene by adding a new sticker to the calendar every day. 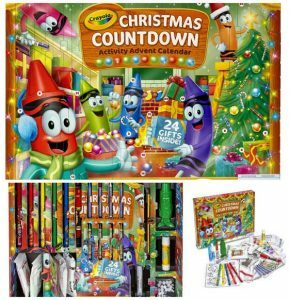 Crafty kids will love counting down the days until Christmas with this activity advent calendar by Crayola. 24 days of arts and crafts supplies and activities are waiting behind these doors. Toddlers will love this soft nativity calendar. They’ll remove a cute, puffy character from the correct pocket each day, and add it to the manger scene. The large numbers promote number recognition, and velcro makes it easy for young children to arrange and re-arrange the characters. I can’t believe how many different Playmobile advent calendars there are. There are far more than the ones I’ve shown in the collage above. 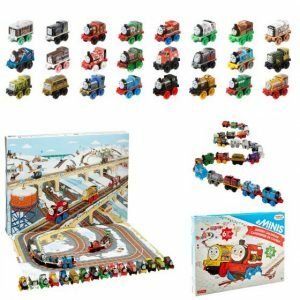 Each calendar contains 24 Playmobile figures and accessories. 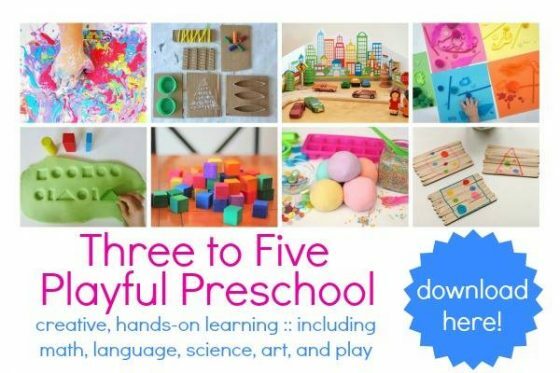 Some of the themes available are: dragons, hockey, farm, princess wedding, pirates, Santa’s workshop, dress-up party, police, unicorn-fairyland, pony ranch, fire rescue and more! Kowabunga Dude! 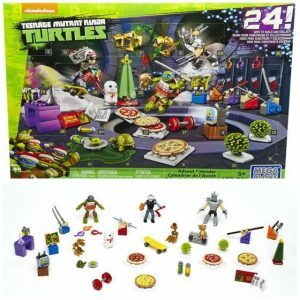 24 TMNT-themed surprises hide behind the doors of this rad advent calendar. This one is so precious. Imagine opening a door to these little bundles of cuteness every day for weeks! This set includes 18 stackable characters and 6 stackable accessories. Adorable! 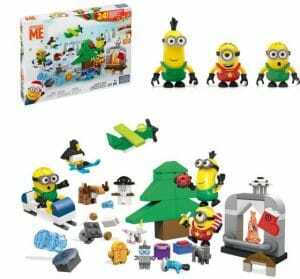 Despicable Me fans will have fun counting down the days with the minions!. There are 3 never-before-seen holiday minion characters included in the 24 daily surprises. Yay! 24 days of Barbie clothes and accessories! There are several different themes to chose from. There are lots of themes for these ones too! 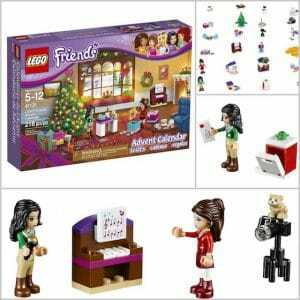 Behind the doors of the LEGO Friends calendars, your kids will find 2 LEGO mini figures and a 24 fun accessories. 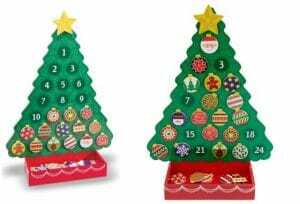 Young children will love decorating this wooden Christmas tree with a new magnetic ornament every day. When the tree is complete – it’s Christmas-time! My boys were SO into Imaginext! They would’ve loved receiving a new rescue play piece every day! 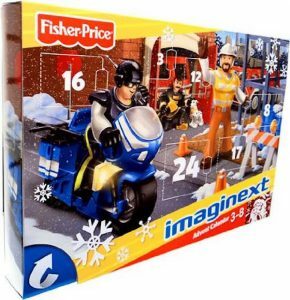 This set includes 3 figures, a motorcycle, 2 helmets, tools and a variety of other play pieces. 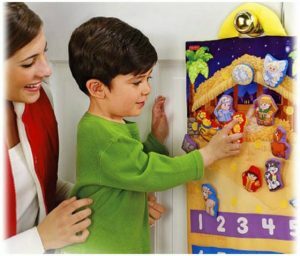 According to one review, if you pay attention, the order of the toys tells a story, and the story unfolds as each new door is opened. Well, there you have it! 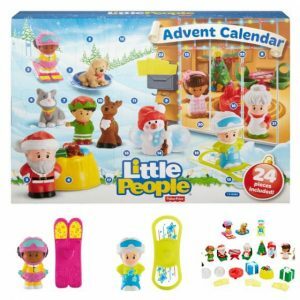 Lots and lots of fun and exciting advent calendars to help your family count down to Christmas Day. It’s a long month filled with anticipation and excitement, and I have a feeling these calendars will help to make the wait just a little more bearable for your kids. If you’re looking for more fun and exciting ways to countdown to Christmas, check out our 7 adorable alternatives to Elf on the Shelf! I didn’t realize how many advent calendars there are! I really like the Lego and Playmobil calendars because they can be added to your Lego and block sets and played with throughout the year. 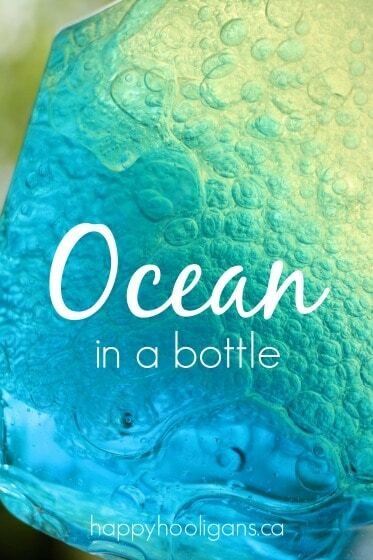 They would make a nice gift from a parent and child to a teacher. Hi Nancy, you can unsubscribe from receiving my blog posts in your inbox if you scroll to the bottom of one of my emails and click the unsubscribe button. Please come on back and join us anytime!